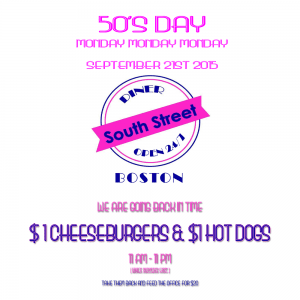 South Street Diner 50’s Day: $1 Cheeseburgers and Hot Dogs! Take a step back into time on Monday, September 21, 2015 at the South Street Diner with $1 Cheeseburgers and $1 Hot Dogs from 11am to 11pm or while supplies last. The South Street Diner is located at 178 Kneeland Street in Boston. For more information, please head here. Will you be attending 50’s day at the South Street Diner?